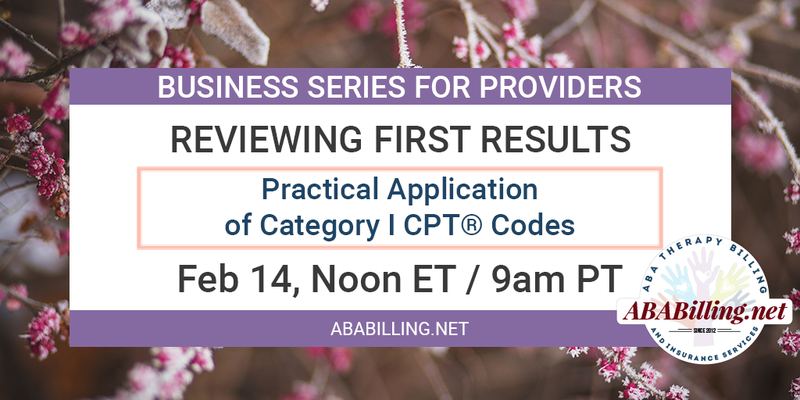 Now that the first month has passed, let’s review the results of authorizations and communication with the health plans and how to use the ABA Steering Committee Supplemental Guidance on Interpreting and Applying the 2019 CPT® Codes for Adaptive Behavior Services for ADVOCACY in accurate implementation of the new codes. We will discuss the highlights of some of the difficulties providers have encountered with interpretation of the codes by health plans, and other areas of concern such as secondary insurance where plans interpret the codes differently. Feel free to bring your live examples for Q&A. Purchase registration for our live webinar by clicking the purchase link below. You will have permanent access to this webinar’s replay after it is posted. Live webinar attendee information will arrive by email shortly after payment is completed (there may be delays due to the holiday). If you have Gold Membership, we take care of registering you for live webinars! And you already have access to all on demand replays! All other webinar replays are available to purchase a 30-day membership at any time once posted.